We find out why Dell’s compact digital projector is the perfect solution for tech-savvy photographers on the move. Digital projectors have always been tempting for photographers, as they allow images to be displayed at a far larger size than on-screen or in print. But the size, weight and expense of projectors has been enough to put most photographers off in the past, with many feeling their hard-earned pounds are better spent on more core kit like cameras and lenses. 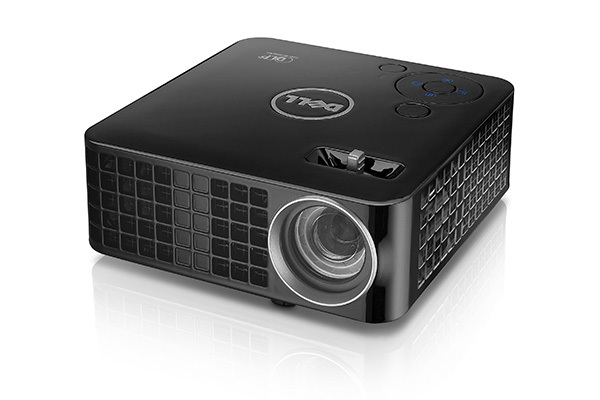 Dell’s new M115HD is one of a new breed of ultra-compact projectors that are small enough to fit in the palm of your hand. And at only 363g (without cables), it’s a fraction of the weight of a digital projector of old. The key to its portability is that it uses an LED bulb, which is a lot smaller and lighter than a traditional incandescent bulb. LEDs also boast an impressive 30,000-hour lifecycle, have virtually no warm-up time and kick out far less heat. Despite running much cooler, there are two small fans to keep the unit cool. They’re not too loud but are noticeable, which is a problem if you’re relying on the rather feeble 1W built-in speaker. To get around this, simply connect portable speakers to the 3.5mm audio out socket when watching movies or playing music. The M115HD’s bulb has a maximum brightness of 450 lumens, which is easily bright enough for home use. In fact, when viewing images in a dark room the result is really impressive, with crystal clear detail and good colour and contrast fidelity. Very small text sizes can be difficult to read and occasionally scaling artefacts are visible, though these are only minor gripes. The M115HD’s projection range is 0.97m to 2.58m, which allows a maximum diagonal screen size of over 2m, and focus is changed manually on the top of the unit. With a resolution of 1280x800 WXGA, the projection is HD but not Full HD (1080p). On the bottom of the M115HD is an adjustable rubber foot to raise or lower the projector, and vertical correction is built-in so the projection is never distorted. Connect directly to a laptop, tablet or smartphone via VGA, USB or HDMI, or wirelessly using a USB dongle (sold separately). If you don’t have a phone, tablet or laptop, simply insert a USB stick or MicroSD card with your images, PDFs, movies or office documents on and project them straight from there. Alternatively, store files in the 1GB built-in memory. We’re really impressed by the Dell M115HD. It might not be the most powerful projector on the market, but its 450 lumens LED bulb kicks out easily enough light for home use, even in large rooms. Colour and contrast fidelity are good, though there is a slight rainbow effect (the separation of red, green and blue light) around areas of high contrast. There are plenty of external connections built-in, so connecting a smartphone, tablet, laptop, USB stick or MicroSD memory card is easy, and the 1GB built-in memory means you can use the projector without the need for any other device. Users can buy a separate Wi-Fi dongle for around £40, allowing wireless connectivity via the Dell app, and there’s also a credit card-sized remote control available. Our main criticism is the feeble 1W speaker, though connecting inexpensive portable speakers is no big deal. Overall, this is a good deal at £339. This review was first published in the May 2014 issue of Digital Photo - download back issues here.